A healthy, beautiful, strong, and radiant hair all day long is everyone's dream. It can also boost confidence as well as positive judgment when first meeting someone. However, it is not always we can maintain our hair in order to always be healthy and beautiful in everyday life that filled with various activities. For those who often intersect with open air, sunlight and pollution can make the hair becomes dull. When the hair has pengery, painting or blow dry and re-bonding, this can lead to hair broken and fall out. If you have this, you may be frowning in the mirror. Because when all the clothes look perfect, there is a feeling of prop in the heart. Your hair turns out not to be in tune with what you want. Nature actually offers an abundance of wealth to overcome the hair problems experienced by millions of people around the world. 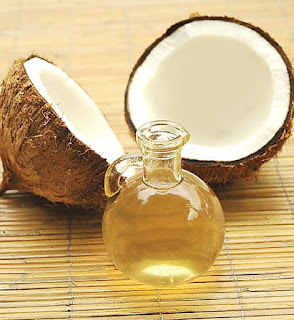 One of them can be found in coconut that has been known for a long time has various benefits in the field of beauty, not to mention about hair care. One of the benefits of tropical herbs that has the Latin name Cocos nucifera is to overcome the problem of dandruff. Who does not know dandruff that often makes the scalp itch. Make hands feel fierce want to scratch it. As a result, the scalp injury and it can reduced your elegance if at all times you have to scratch the head. Coconut water can overcome this because it contains tannin which is an antibacterial and vitamin C. The content can eliminate dandruff. In addition to dandruff, more and more gray people are now found at a relatively young age. The cause was diverse, one of them come from the use of shampoo Containing synthetic chemicals ingredient. The Problems with synthetic chemicals cause many people to return to traditional medicine, especially by using organic ingredients, like organic coconut water. Some people choose to remove gray hair by painting the hair, this solution is temporary. For more healthy solution, you can us coconut water, with this tropical herbal plant, the appearance of the white hair can be postponed. Even when it is already exist, the efficacy of coconut can reduce the gray hair area. Even when it is already exist, the efficacy of coconut can reduce the gray hair area. Another problem surrounding the crown of the head is when it has dry or oily hair. The situation is certainly very unpleasant. The reason is, dry hair becomes easily broken, while greasy hair easily dirty and limp. How to cope, hair must be moistened. Here the coconut water plays another role because its vitamin C content can reduce the oil as well as moisturize the hair. Other than using coconut water, you can use coconut oil and wheat flour as a hair moisturizer. You may feel it is strange with the material, but just calm down, you didn’t read it wrong. The mixture of coconut oil and wheat flour does have a very good effect for your hair. To overcome the problem of dry hair with coconut oil the way is as follows: Mix the organic coconut oil and flour into the container until evenly distributed. Apply all the mixture to the head. Make sure you rub it to the scalp. Let stand for about 5 minutes and rinse with clean water. Coconut oil is believed to make head lice on the headache, limp to death. In addition, coconut oil can also help maintain healthy hair throughout. How to use it is very easy. You can immediately apply coconut oil to the entire scalp and hair. You can also add camphor to increase its usefulness. If it has been massaged evenly, wash your hair using shampoo and clean water. This way you can do at night and rinse in the morning. There is so many natural treatment for almost all of your healthy problem and you don’t need to expense much money to use it. So, try to always use natural herbal remedy for your healthy problem. But if it doesn’t work, you should visit your doctor.